﻿ How to Play AVI on Android Nexus One/Samsung Galaxy/HTC/Motorola Droid? Home » video » How to Play AVI on Android Nexus One/Samsung Galaxy/Motorola Droid/HTC? How to Play AVI on Android Nexus One/Samsung Galaxy/Motorola Droid/HTC? Though Android is developed by the Open Handset Alliance, this smartphone platform only supports H.263, H.264 AVC, MPEG-4 SP and VP8 video format. Hence it is impossible to play AVI on Android phones. This article will introduce a powerful AVI to Android Converter as well as describe a step by step guide on how to convert AVI to Android supported video format. Then it is just easy to stream AVI to Android Phone for playing AVI on Android Nexus One, Samsung Galaxy, HTC, Motorola Droid and G1 and more. Besides, this powerful AVI to Android Converter can also convert other video formats to Android format like convert MKV to Android, FLV to Android, WTV to Android, MPG to Android, MOV to Android, WMV to Android, VOB to Android, ASF to Android and etc. 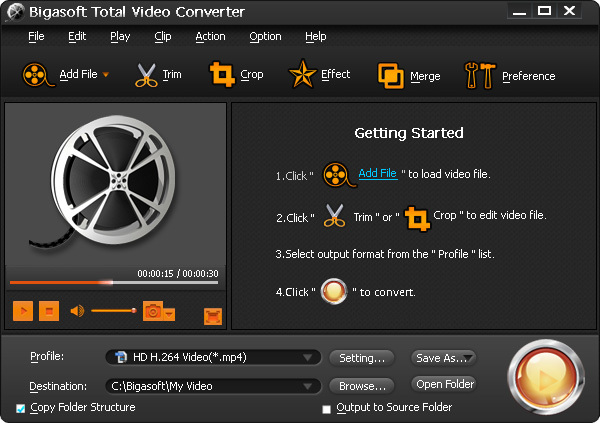 Moreover, you can also convert AVI to other video formats including MP4, WMV, MPEG, MOV, MKV, FLV, F4V, 3GP, 3GPP, DivX, Xvid, MPEG-1, MPEG-2, ASF, H.264, RM, WebM, VP8 and more. The following is a step by step guide on how to convert AVI to Android phone format so as to successfully stream AVI to Android for play AVI on Android Samsung Galaxy, G1, HTC, and Motorola Droid and etc. 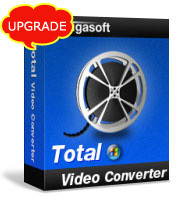 Free download the professional AVI to Android Converter - Bigasoft Total Video Converter (Windows Version, Mac Version), install and run it, the following interface will pop up. Click "Add File" button to import AVI file to this AVI to Android converter software. Click the small triangle to the right of Profile, a drop down menu will pop up, then select "MPEG4 Video(*.mp4)" from "General Video" Category. Click "Convert" button to start converting AVI to MPEG-4 for Android phones. After finishing the conversion, just stream and transfer the converted AVI to Android phone for play AVI on Android Nexus One/Samsung Galaxy/Motorola Droid/HTC on the go. Wait no more, just free download the powerful AVI to Android converter to have a free try.